Apple’s consumer filmmaking software, iMovie, has gotten its fair share of both praise and scorn over the years. It broke new ground in its initial release by giving families and budding filmmakers a way to edit films that didn’t cost thousands of dollars. It reinvented itself and how to make films in 2008—though some would argue it didn’t actually make it to the “usability” stage until the next year. Now it’s reinvented itself all over again; thankfully, this time it left out that awkward, gangly in-between year. 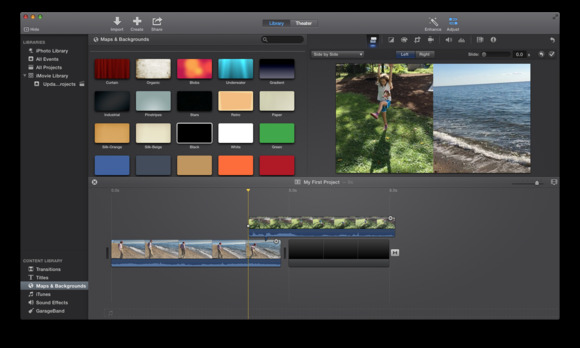 Apple’s new version of iMovie is sleek and sophisticated both on the Mac and on iOS devices. It retains a lot of advanced features from prior versions, but keeps its interface clutter- and confusion-free for newer users. And it’s added a new avenue for easily sharing movies to your computer and Apple TV. I could go on like this for awhile, but instead of writing a whole review here, I’m going to cut to the juicy parts and focus on twenty new and improved features in iMovie for the Mac and on iOS. iMovie has always been a bit of an odd sibling to its big brother, Final Cut, in terms of both features and appearance. It never quite had the same timeline handling, or the right look; sometimes it would be ahead of Final Cut’s development curve, sometimes far behind. This version of iMovie, however, can stand proudly alongside its big brother. It has the same “space gray” coloration and timeline handling, and though it pales in comparison to Final Cut’s feature-set, it still has a decent number of tools in its toolbox. 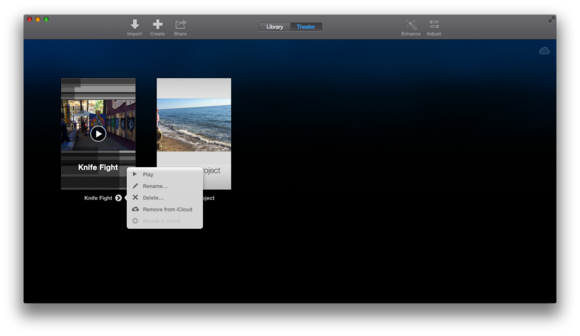 On its surface, iMovie looks rather simplistic. But dig a little deeper and you'll find all the features you know and love from prior versions. But unlike previous versions of iMovie, those tools aren’t out in the open—they’re instead secreted away behind simplistic-looking buttons that won’t scare off casual filmmakers or beginners. The first thing you see upon launching the program is a collection of your event clips and a big viewing screen—you don’t even have to make a project if all you want to do is find and share a particular clip. Its initial treatment reminds me far more of iPhoto’s management options than of a piece of video-editing software. But once you open up a project, it becomes clear that those editing chops are still there. On the Mac, iMovie’s myriad buttons and shiny aluminum textures are all gone, replaced with a few distinct sections: a sidebar for accessing your photos, video, projects, and content library; buttons for importing video, creating new projects, and sharing clips/projects; a tab switch between iMovie’s Library screen and iMovie Theater; and two editing buttons: Enhance and Adjust. That’s it. There are zoom sliders here and there, and a search bar, but the dozens of unlabeled buttons and confusing sections have gone the way of the dodo. iOS gets a slightly less revolutionary take, as by nature the mobile app is more simplified than its Mac counterpart. But its iOS 7 overhaul is well-done nonetheless, splitting the app into three main categories: Video, Projects, and Theater. The Video screen is your Library equivalent, showing you mini timelines of the clips in your camera roll. For the first time on iOS, you can organize these with the new Favorite button (shaped like a heart), and there are even buttons to quickly speed something up or slow it down and share the clip on the spot. Decide to combine it with other clips, however, and you enter the Projects screen. Projects look much like events at first; tap one to get a brief informational overview and options to share or export it, as well as a button to enter editing mode. And once you’re finished, you can send the final version to iMovie Theater, where it can be viewed by other iOS devices, Macs, and even your Apple TV. The undo button is hyper-prominent in iMovie, both on the Mac and iOS. It’s shaped like a small backwards arrow on the Mac, and a U-turn arrow on iOS devices. On the Mac, the undo button primarily exists to remove any effects from a given section. It’s similar to Final Cut Pro X’s interface in that regard, and I’m very thankful to see it brought over to the consumer side. I almost didn’t have this on my list because I was sure that iMovie ’11 on the Mac had progressed far enough to allow dragging clips on top of each other. 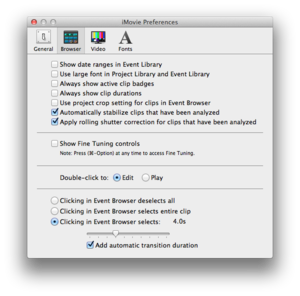 But no: You can drop clips on top of each other in ’11 with Advanced Tools enabled, but easy dragging is out of the question. 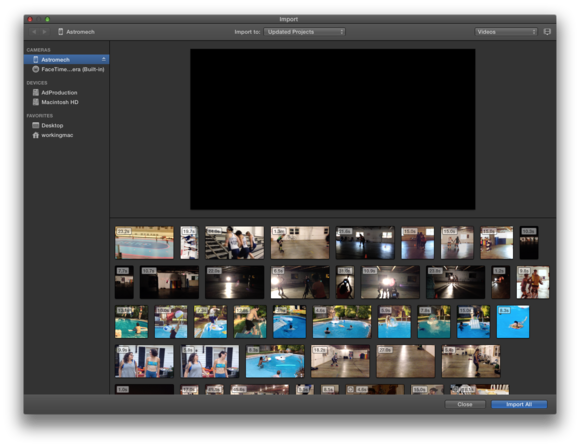 This is a timeline from Final Cut Pro X -- looks awfully similar to iMovie, huh? Forget any notion of “Advanced Tools” in this version of iMovie: You don’t need to go find a checkbox to make any complicated changes. Want to drag one clip on top of another, so they stack? No problem. Change the styling from a straight cutaway to a picture-in-picture, side-by-side, or green screen matte? You got it—just move your playhead to the point where the two clips intersect and open the Adjust menu. You can even add keyframes to picture-in-picture to get the box to move around the screen. Even cooler, if you drag a clip below another clip, it instantly converts to an audio-only soundtrack. Once that clip is imported, you can move it anywhere on that second line—but there’s sadly no way currently to drop it back into the main timeline. Something for Apple to improve upon in its next update, with any luck. Making an iMovie trailer is more fun than it really ought to be. It’s one of those activities that starts fun, wraps around to corny, then pops right back to fun again. 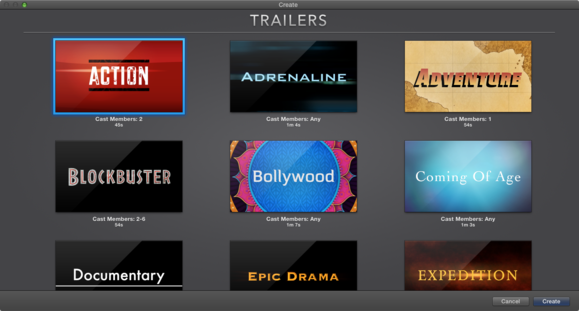 On the Mac, the app has made these even more prominent—when starting a new project, you have the option to make either a movie or a trailer, and there are now 29 trailer templates for your editing pleasure. I suspect half the fun of picking a template is first watching the Apple-created default, though—some of the stock trailers are funnier than I suspect I could ever make my videos. I wasted a half-hour on Wednesday watching the Apple-made stock versions of the trailers. They're hilarious. On iOS, trailers are just as fun to make as they were at launch, though I find the interface changes make them even better to edit on an iPhone than before. The nicest thing about the ever-present Share button, though, is its flexibility. 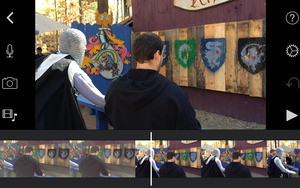 You can send an original or altered clip straight from your library, a final project video, or even the project itself. And this carries over to iMovie on iOS—the Video section of the app offers easy sharing, and you can even apply speed modulation on the spot. When iMovie was announced, Apple made a big show of its flashiest feature: iMovie Theater. This allows you to share a clip or final project from any of your devices and have it show up on any other Mac or iOS device that has iMovie installed and is linked to your Apple ID. Think of it sort of like Photo Stream for your edited videos. As a quick way to share video on your TV or other devices, it’s stellar: You can cut something on your Mac and push it to your iOS device, which you can then take with you and show off wherever you want. You don’t even have to download it to your device—iMovie Theater stores everything on its server by default, so you can stream it if you have a data connection or download it ahead of time, your choice. iMovie Theater does have a few limitations, unfortunately. Unlike Photo Stream, any video you share counts toward your iCloud storage limit; those with the default 5GB of storage may find themselves quickly running out of room. If you re-export a project video, it appears as a duplicate, rather than replace the old version. And perhaps most annoyingly, you can’t share projects—only final videos. Project sharing can still be done from iOS device to iOS device, but you appear to no longer be able to transfer projects to the Mac. Speed modulation is a powerful thing, and Apple seems to have gone whole-hog on the feature with the latest version of iMovie. But if you want to keep your clip’s audio from sounding like it’s underwater, there’s a preference in both versions of iMovie—Mac and iOS—for keeping your audio from changing pitch when modulating a clip’s video speed. After playing with both, I tend to prefer the pitch change, as iMovie has to do wacky things to your audio to keep it at the original pitch, but it’s an option. In comparison to the new version, iMovie ’11 feels positively archaic in its speed optimization. iMovie is downright speedy in comparison to its predecessor, and nowhere is that more evident than in clip import. In my tests, the camera import screen launched and imported video twice as fast as ’11. And oh, I could write an ode to the revised import process. Gone are the “import selected” checkboxes, the “analyze for stabilization” and “optimize video size” options, and any extra nonsense you might have had to first click through before getting to what you wanted to do in the first place—edit your clips. The new version of iMovie treats you with respect. Do you want to import all your clips? Great. Want to just import some of them? Highlight the ones you want, press import. The app’s fast enough now that it doesn’t need you to downscale your HD clips so that you can edit them. Once you’ve imported your clips, you can search through them by name or date, tag your favorites, and sort by favorites or rejected clips. It’s not nearly as complex as Final Cut’s tagging options, but organizing feels easy and simple. iMovie takes yet another card from Final Cut X with background tasks. Say goodbye to progress bars for import, rendering, and sharing—they’re not your problem any more. Nowhere is this more apparent than in the import process: There’s no waiting eternally in front of the import screen, watching a progress bar slowly tick down. Once you select clips for import, they’re are available in your library almost immediately, with clock icons on those still importing. I was even able to scrub through those still importing—I suspect they must load an immediate low-res version to accomplish this, but I’m not really sure. When you’re importing or rendering a clip, there’s a new background tasks icon in the shape of a clock that pops up in the upper right hand corner of the menu bar. It displays any and all currently rendering background tasks, along with a time estimation of when they’re complete. 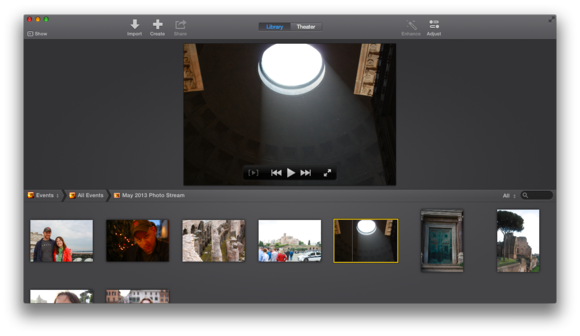 Lots of fiddly features in the old iMovie preferences -- all gone in the new version of iMovie. The interface for the new version of iMovie for Mavericks is easy to read, fun to edit, and simple to share—without removing any truly key features.